Samsung has released unlocked models of its Galaxy S8 and its larger partner the Galaxy S8 Plus. They are only differentiated by their screen size and battery capacity, come in at 5.8-inches and 6.2-inches with extra-tall 18.5:9 aspect ratio displays. That battery difference is pretty subtle: 3500mAh for the Galaxy S8+ and 3000mAh for the standard Galaxy S8. Both the Galaxy S8 and S8 Plus will be the first smartphones available with Qualcomm’s Snapdragon 835 processor. Both have 4GB of RAM, and come with 64GB of internal storage. You can expand it to more than 256GB thanks to MicroSD card support. Android 7.0 Nougat is the operating system, with TouchWiz layered over. The 12-megapixel, f/1.7 rear camera hasn’t changed at all from the S7. The front-facing camera has been upgraded from 5 megapixels to 8 megapixels with an aperture of f/1.7, so you can expect a slight bump in quality for selfies and "groufies." The S8 also had some fun Snapchat-like stickers and emoji you could place and resize directly within the camera app itself, which may appeal to a young crowd. The Galaxy S8 and S8 Plus are both available to pre-order from Wednesday 29 March, with early buyers set to receive their handset on 20 April. The smartphones will be available to all from 28 April. The S8 is listed at $724.99, and the S8 Plus will sell unlocked for $824.99. Suppose you have purchased or rented movies from iTunes Store and want to play them on your new Galaxy S8. The main problem you might come across is that the movies you downloaded from iTunes are M4V with DRM protection. Due to DRM, you can't watch iTunes videos on Galaxy S8 smoothly. That's because DRM can only allow you to play iTunes videos on iPhone, iPad, iPod and Apple TV. If you want to play iTunes movies on Galaxy S8, what you need is an iTunes movies to Galaxy S8 converter. 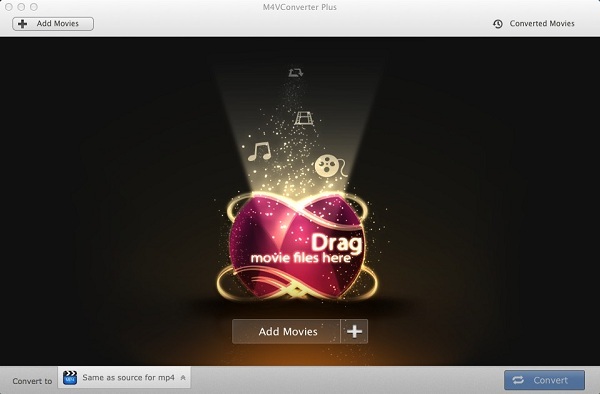 M4V Converter Plus is one of the best iTunes movie converter you can use. With it, you can convert iTunes DRM-ed M4V videos to any popular formats like MP4, MOV, AVI, WMV, FLV, 3PG, etc. Besides, it can directly convert iTunes movies, Rentals or TV Shows to play on Apple devices and Android devices. 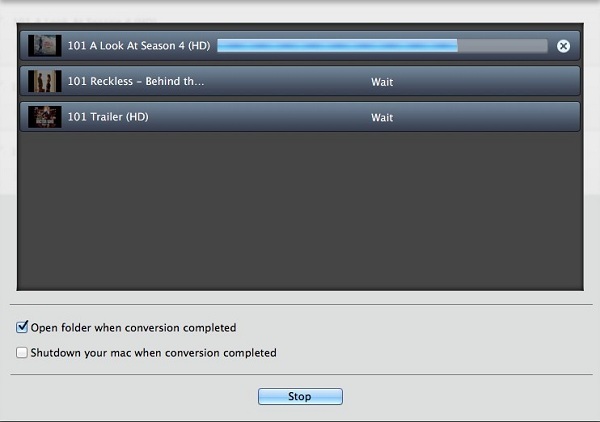 What's more, it can enable you to convert any iTunes videos at 30X faster speed without any quality loss. Samsung Galaxy S8 and S8 Plus support video formats, including MP4, M4V, 3GP, WMV, ASF, AVI, FLV, MKV, WEBM, MPEG4, H.263, H.264, VC-1, VP8, WMV7 / 8, MP43, Sorenson Spark, HEVC. If you want to transfer iTunes movies or TV Shows to Galaxy S8, you need to convert them to S8 supported video format first. 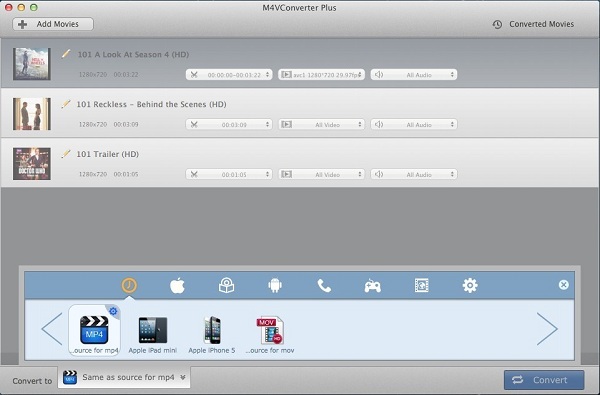 Now free download M4V Converter Plus on your Mac and go to try by yourself. Step 1. Install M4V Converter Plus on your computer and launch it. Step 2. Import iTunes movies or TV Shows to the program. You can simply drag and drop the iTunes movies to the program interface. Alternatively, you can also click Add Movies button on the top left to import iTunes videos to the main window. Step 3. Select a Samsung Galaxy S8 compatible format. Click Convert to profile drop-down list, you can select a proper output video format for Galaxy S8. Here we choose Same as source for mp4 as output format. Step 4. Start iTunes Movies to Galaxy S8 conversion. Click Convert button, the conversion will begin automatically. A minute later, you can find the converted iTunes movies on the Converted Movies folder. Step 5. Transfer iTunes movies to Galaxy S8 conversion. Connect new Galaxy S8 to your computer using the supplied USB/charging cable. And navigate to the detected device and open it on your computer. 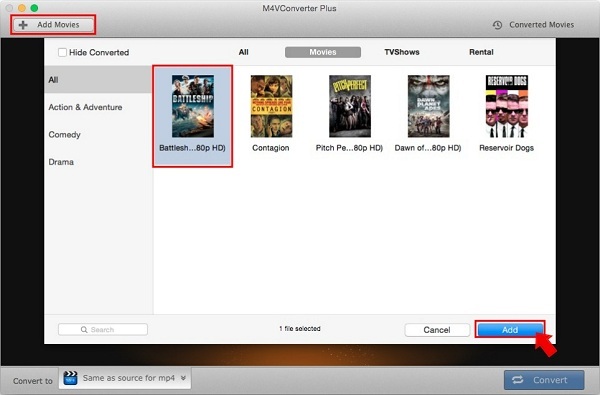 Then select a folder (for example, Videos or Movies) and copy the converted iTunes files to it from your computer. When you are done, disconnect your phone from your computer. Now you can play any iTunes videos on Samsung Galaxy S8 and S8 Plus at will.